When you think of designing your home, chances are the first thing you think of isn’t windows and their coverings, but according to Home Artisans of Indiana, it really should be. Ryan Lee, trade specialist with Pella Windows & Doors, says it’s wise to build 2×6 rather than 2×4 windows for several reasons. Not only are 2×6 walls more energy efficient since there is more room for insulation, but extending the wall pocket by two inches allows homeowners to install whatever window treatments they want as shades and blinds won’t intrude inside the room. Lee has also noticed a trend of no interior trim. It goes back to the importance of planning. 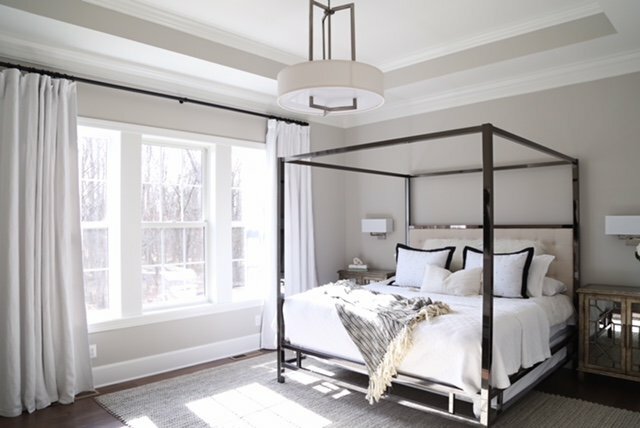 Caryn O’Sullivan, owner of Drapery Street agrees that the earlier in the planning process a homeowner consults with a window covering designer, the better and more integrated the end result will be. Considering how to approach a window covering on a casement window is different than a slider or a tilted window. Christina Greive, Principal Artist and CoOwner of Polish Interior and Art Design, notes that natural light is a quintessential part of design as it warms a space and promotes healthy living. So, of course, does a great view. Though there are times when the sun is heating up a room at a certain time of day or a glare is crossing the television screen, experts can help homeowners address such issues without sacrificing view or design.